I stroll nonchalantly past the immense image of Christ in the Vatican’s Gallery of Tapestries. My guide, Giulio, tells me that people sometimes think Jesus follows them with his eyes. I’m not going to fall for that, I think, watching the Son of God carefully. But…has he actually turned slightly to keep me in view? I pivot and walk in the other direction, feeling a slight shiver, then turn again to retrace my steps. He is following me! I swear to…oops, better not to say that here. Giulio smiles, watching me. He’s seen this before. We’re walking through the halls of the Vatican early, before the tourist throng arrives. I’ve been on tours where I’m shepherded through a predetermined route designed to keep traffic moving through the major sights. You’ve seen the likes: a recent college grad holding up a little flag and running through what can only be described as a rehearsed spiel, while 15-30 sheep—I mean people—try to keep up. But this is different. I’m seeing things I wouldn’t have noticed if I was craning my neck over the shoulders and cameras of other tourists. 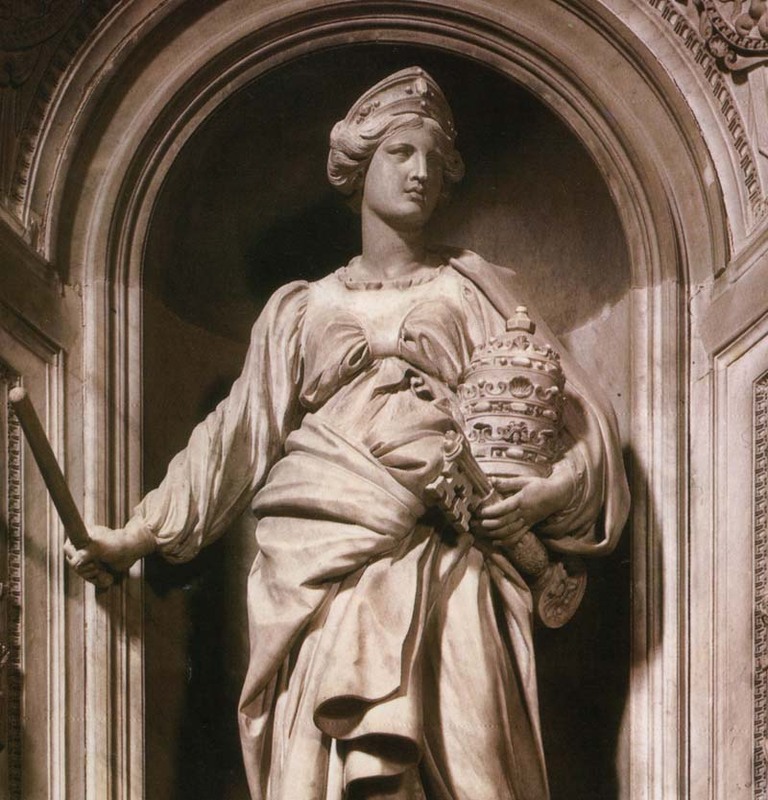 In the Gallery of Maps, for example, the lovely hand-drawn depictions of Italy, created by the brothers Danti for Pope Gregory VIII in the 1500s, many of which do not have the North at the top. Rome tends to be the prominent landmark on these depictions of the Mediterranean landscape; after all, during that time, Rome was thought to be the centre of the world—certainly, at least, by the Romans. This early, the typical “Silence!” from the security guards in the Sistine Chapel is absent; only a handful of people are here. With no hub-bub, I take my time and explore the details of Michelangelo’s ceiling and Last Judgment to my satisfaction, along with the depictions of the lives of Jesus and Moses on the left and right walls, created by Botticelli and other artists. I try and imagine what it must have been like when Pope Sixtus IV commissioned this fortress-like chapel in the 1470s. His coat of arms hangs above the door opposite the altar, with the oak tree, his family symbol, as its crest. In Sixtus’ time, prior to Michelangelo, the chapel ceiling was a night sky filled with stars. To the left of the altar is a door, slightly ajar—the entrance to the Room of Tears. I sidle up and catch a glimpse of the red couch on which a new Pope collapses in an emotional heap after winning the election. Farther back is a stove, brought into the chapel during each election to emit white smoke, thereby telling the faithful in St. Peter’s Square that a new Pope has been chosen. 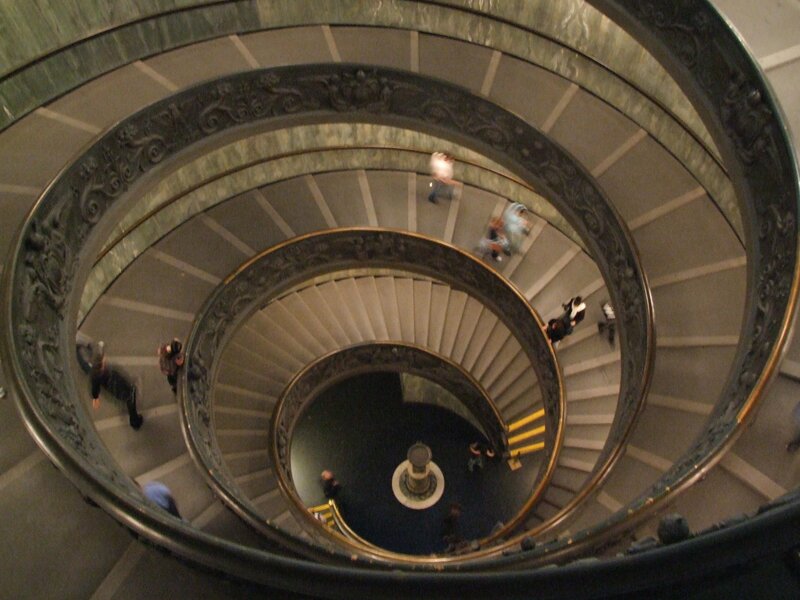 Exiting the chapel, we short-cut past Bernini’s lovely staircase and onto St. Peter’s Square, walking across huge stones pillaged from the Colosseum. The huge bronze doors on the left of the Basilica entrance were kept from the original church erected here by Constantine around 300 AD. The lives and deaths of saints Paul and Peter—the two “pillars” of the Church—are chronicled here in bas-relief. The Vatican is here, of course, because of St. Peter. Thirty years after Jesus’ death, Peter came to Rome, was arrested and then killed under Emperor Nero. 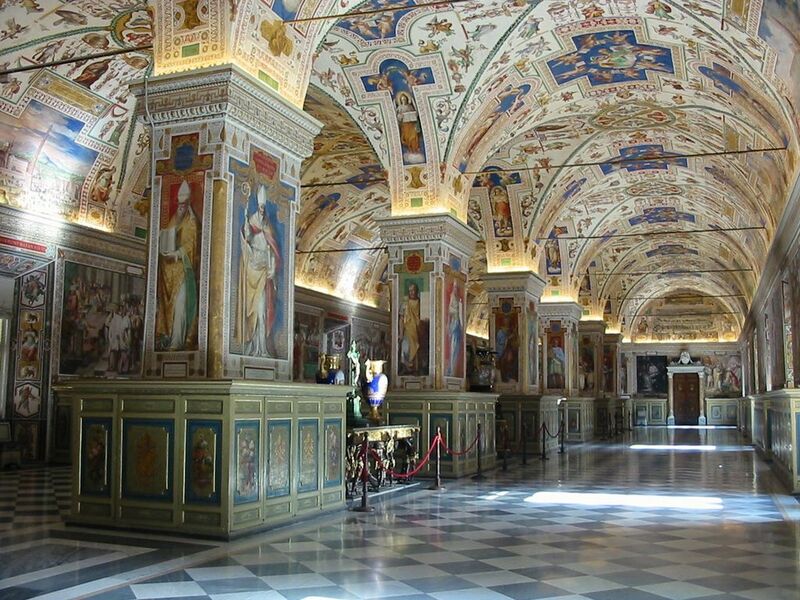 His body has been entombed here ever since, and some 1200 years after Constantine’s Basilica, Pope Julius II commissioned the current St. Peter’s and hired Michelangelo to paint the Sistine Chapel. I look closely at the “paintings” inside the Basilica—they’re not actually paintings at all, but mosaics, thousands of tiny tiles fashioned into religious works of art. 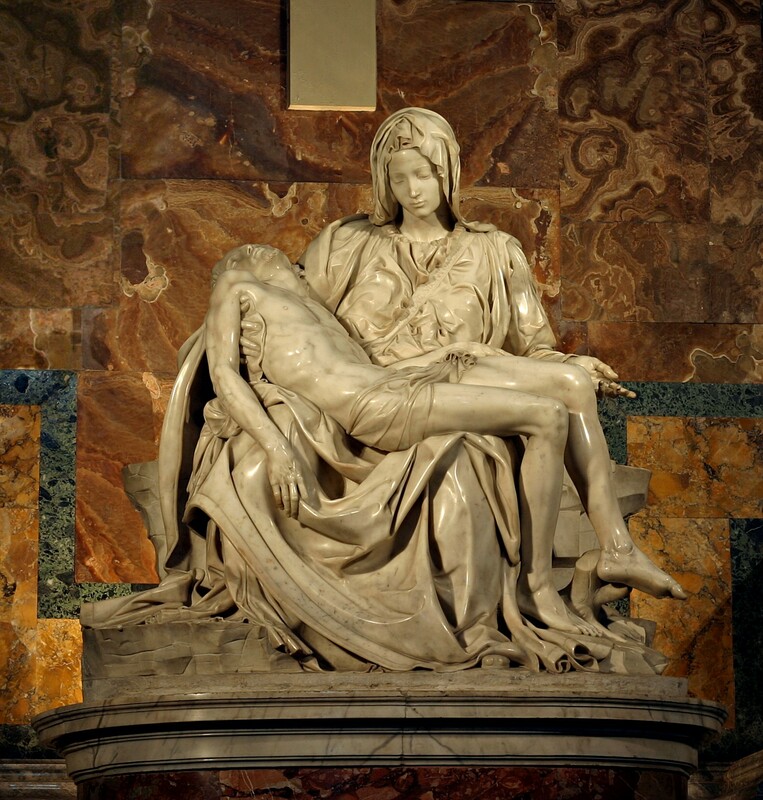 These, along with Michelangelo’s Pietà, many other sculptures and 46 altars, including Bernini’s grand design from the 1600s, form a spectacular backdrop for various tombs and memorials. Finally, we head downstairs to explore the crypt and ogle the tomb of St. Peter. Down here are remnants of the first Basilica, along with the remains of some 200 Popes. One of them has been moved recently—John Paul II, who ascended to a more impressive spot next to the Pietà upstairs, at the time of his beatification last year. Blinking my eyes at the bright Roman sun as we emerge from the church, I’m satisfied, but not overwhelmed by all I’ve seen—and, because we came early, I still have the whole day in front of me. I exchange “Arrivederci” with Giulio, and linger awhile in the square, smiling at the throngs, just now beginning to assemble.